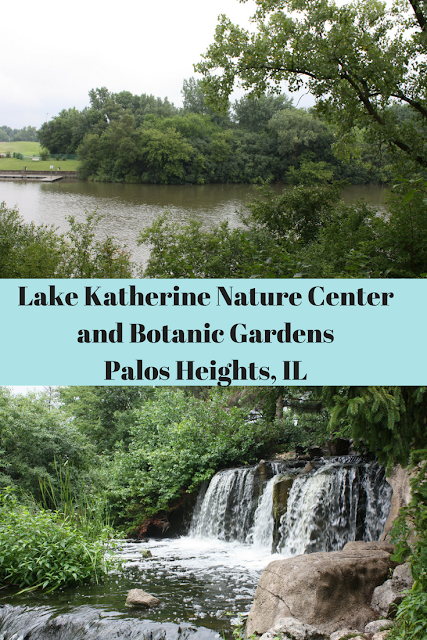 Lake Katherine Nature Center and Botanic Gardens in Palos Heights, Illinois provided us with a lovely nature escape last week. The landscape at Lake Katherine offers several different nature experiences to the delight of visitors. The setting with a lake, waterfalls and variety of brilliant blooms creates a lovely spot for a variety of functions and some visitors were in fact scoping it out while we were there. Before embarking on a hike around the lake, we visited the learning garden which had plenty to look at with gardening season in full swing. The learning garden is full of growing produce at various stages this time of year. The learning garden is adjacent to the prairie which was abuzz with butterflies! Monarch resting in the prairie. Next, we headed towards the waterfall where I discovered this alcove. Who doesn't love a waterfall? There were more trails in this area that we would like to explore. After pondering in the peaceful alcove, we climbed down closer to the waterfall. The waterfall is man-made but stunning nonetheless. We took a peek at the lake and spotted ducks taking a nap. Other families were scoping out the area, I think looking for spots for a function. Napping ducks at the lake front. There is a butterfly garden as well. The funny thing -- we saw quite a few butterflies throughout the preserve but not one at the garden! Next, we walked in a more forested area which had views of the lake as well as the Calumet Sag Channel. There are some paths that will take you closer than the main path. The school house arch at the Children's Forest is the salvaged remains of Palos School which was constructed in 1941 and demolished in 1989. Cool piece! As we rounded about the lake, we discovered an egret! 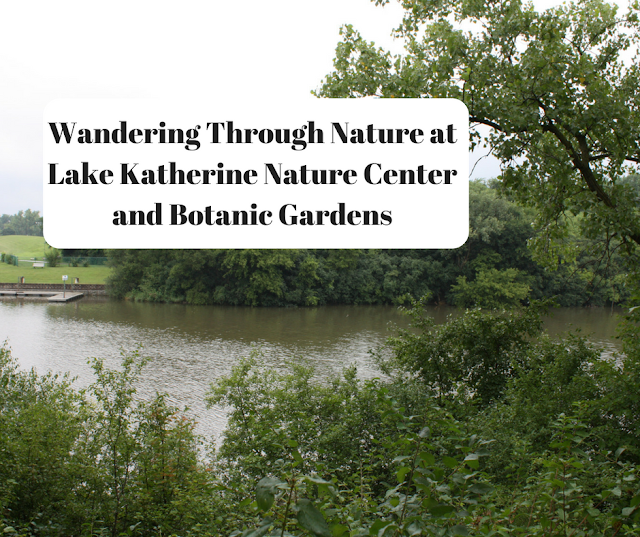 Lake Katherine Nature Center and Botanic Gardens is a natural treasure with a variety of nature experiences. The preserve is a wonderful place to enjoy an afternoon of wandering through nature and escaping everyday life for just a little bit. Lake Katherine is on the Cal-Sag Trail which will eventually be a 26-mile bike trail connecting the Chicago Southland from Indiana to Lemont. Sections of the trail are already open with some under construction. The Nature Center is closed on Sundays but there is still a lot to do. There was a story walk designed for younger children during our visit. Kayaking is available during certain times; see schedule. I had no idea Lake Katherine Nature Center existed. What a beautiful, tranquil place. Your shot of the monarch is exquisite. We haven't fully explored Lake Katherine, but we love their waterfall. It's awesome during St. Patty's day when they dye it green.